Stemonitaceae (Stemonitales, Stemonitomycetidae) is represented by seven of its 197 species in mangroves of different countries. Aiming to contribute to amplify this limited knowledge, the myxobiota occurring in Brazilian mangroves situated on the southern coast of the state of Pernambuco was investigated. Samples were collected of aerial litter, small woody twigs, soil litter, the bark of living trees and the fruit of Conocarpus erectus, Rhizophora mangle, Laguncularia racemosa and Avicennia nitida at the beginning of the rainy season (April), during the dry season (October) and at the end of the dry season (March). The material collected was used to mount 1008 moist-chamber cultures, observed weekly for three consecutive months in order to record the presence of plasmodia and/or sporocarps. The following species were recorded: Collaria arcyrionema, Comatricha pulchella*, Macbrideola scintillans*¸ Stemonaria fuscoides, S. irregularis*, Stemonitis flavogenita*, S. fusca, S. herbatica*, S. splendens, S. virginiensis* and Stemonitopsis reticulata* (species marked with an asterisk are new records for this type of environment). The worldwide distribution of these species in mangroves and different regions in Brazil is discussed. 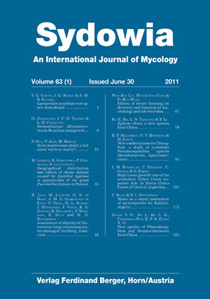 Keywords: Stemonitomycetidae, taxonomy, myxobiota, Rhizophora, Conocarpus.